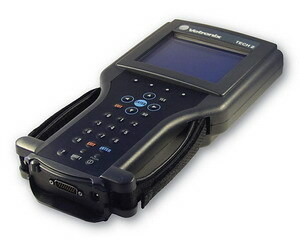 The Vauxhall Tech 2 offers diagnostic functions available for 1992 and newer General Motors vehicles. Tech 2 software is individual for each brand. The Vauxhall Tech 2 Scan Tester is a scan tool for GM and affiliated (e.g., Suzuki, Isuzu, Holdens, Saab, AM General, and Opel/Vauxhall) dealerships worldwide. Dimensions: 12" x 6" x 2"
Screen: 3.8" x 2.8" backlit monochrome with full graphics capabilities: 320 x 240 pixels. Displays up to 9 vehicle parameters at once. Please note that this page is about original diagnostic tool provided by vehicle manufacturer. The tool can be usually bought only by authorised dealer. We do NOT sell this equipment. The page is intended only for educational purposes. We provide our own third-party scantools for automotive diagnostics, both for after-market repair and as an alternative for original delaer tools. Please use navigation bars at the top of this page or left navigation menu to select appropriate diagnostic software. We provide aftermarket replacement for this tool. For more information click on Opel/Vaxuhall/Holden diagnostic scan tool information page.